1. Encourage students to visit an indigenous art gallery and/or to use other sources to examine a range of indigenous art. Investigate what appears to be some central ideas running through many of the indigenous art works. 2. Using the paintings shown in the video clip how is the centrality of country to the identity of indigenous people shown in the paintings. Try to explain the connection between the land and indigenous culture or way of life. 3. 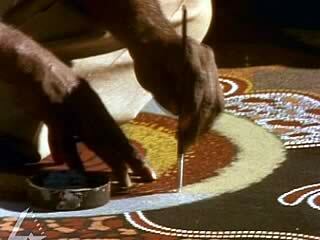 It is sometimes said that ‘indigenous art is like a topographic mapping of their land and culture’. Thinking about the video clip and other sources what do you think this means? 4. Invite a member of the indigenous community and/or a indigenous art gallery owner to class to show and discuss indigenous art. 5. In pairs research examples of traditional Australian Indigenous art that derive from a specific locality or geographic region. Prepare an informative written and illustrated report of about 500–700 words discussing the various features of the art, and the ways in which it expresses elements of the Dreaming.